Vanguard ID Systems has developed a weatherproof NFC luggage tag with an e-ink display that can be updated each time a traveller takes a flight and provides owners with information on their bag’s location throughout a journey. “The ViewTag works in conjunction with SMS text messaging,” the company says. “Throughout all airports, there is an RFID reader located on the loading belt for the aircraft. 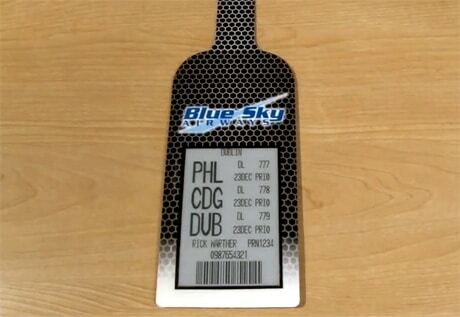 This RFID reader scans the ViewTag as it passes on-board the plane and sends a confirmation message to the subscriber.